VYP members hear from Valley Leaders, share what makes a good mentor. Mentorship provides benefits for both mentor and mentee. Mentors offer encouragement, advice and often a unique perspective informed by years of experience. Mentees receive help in their professional lives, and often provide their own take on thriving in today’s professional world. 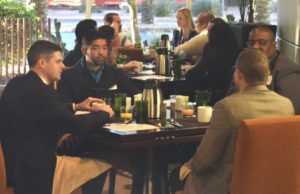 The invitation-only 5th Annual VYP Mentor Breakfast on Nov. 30 paired Valley Young Professionals (VYP) with Valley business leaders for intimate discussions on workplace success and moving a career forward. VYP members shared insights including what characteristics make a good mentor and what young professionals should seek when considering approaching someone to mentor them. What was your top takeaway from attending the 5th Annual VYP Mentor Breakfast? I am very passionate about my community and the prosperity of the people in it. It was wonderful to get to sit down with some of the most impressive business leaders in Arizona from a variety of industries to discuss a common mission, the success of young professionals and how that will drive the success of our community in the years to come. It gave me the opportunity to have a meaningful conversation with a leader in the community that is outside my own company, network and industry. During the conversation, in which both parties were looking to listen and learn from each other, we found that we had a lot in common despite our different career paths. Also, my mentor had a fresh take on many of the issues I have recently been struggling with at work. I had a great time at the breakfast. Not only did I have an opportunity to network and learn from a knowledgeable professional in my field, but I also met peers with whom I have a lot in common and can share ideas with. Always make sure you find a balance. A lot of the time people focus on one area so much that they forget to give attention to other aspects of their job. Awareness is very important to achieve any type of success. Someone who has the patience to take time and truly listen to whoever seeks their help. The best way to knowing what someone really needs is listening. Someone who people can relate to, possesses great listening skills and is able to tell a meaningful story based on their past experiences. A great coach and teacher. It is a basic assumption of mine that mentors are knowledgeable and skilled in their professional lives. What makes a mentor great is the ability to listen and understand, to empathize with where their mentee is and to coach them to become better. Someone who genuinely cares about their mentee’s success and is willing to listen and learn from their mentee in addition to providing guidance. I think the relationship works best when it’s a two–way street and both parties can grow personally and professionally. What should someone look for in a mentor? Look to someone who is genuine, aspiring, personable and dependable. Try not to focus solely on the tangible characteristic of a mentor, look for some intangible traits that you admire in people. Enviable expertise, a deep sense of empathy and an incredible capacity to listen and understand. I’m not a big advocate of specifically seeking out a mentor because I believe for the relationship to be successful there is a need for it to happen organically. Instead, I think those looking for a mentor’s guidance should focus on talking to and developing relationships with lots of different people. You never know when a conversation could spark something deeper. 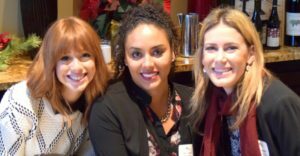 –Join VYP on Tuesday, Jan. 24 to hear valuable insight from the 2016 ATHENA Young Professional Award finalists on achieving success as a young professional. As up–and–coming businesswomen who have already made an impact on our community, Catherine Alonzo, Julia Meyerson and Vanessa Valenzuela Erickson will focus on professional development and what steps young professionals should take to advance their careers and skill sets. Register here.